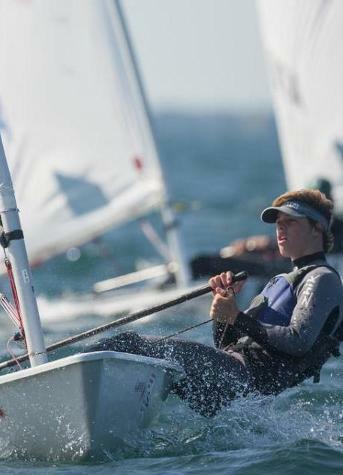 NORFOLK, Va. – After some exceptionally close and competitive racing, sophomore Malcolm Lamphere took home the Glen S. Foster Trophy for placing first at the ICSA Men’s Singlehanded National Championship. Junior Mitchell Kiss and freshman Nic Baird also had outstanding performances, placing fifth and seventh, respectively. The weekend started slowly. On Saturday, marginal breeze postponed racing for most of the day, and only three races were completed in a light 3-6 knot breeze. At this point, Baird sat in first, Lamphere sat in second and Kiss in fourth. Sunday’s wind conditions were much better than Saturday’s: a 15-knot northeasterly predominated for most of the day. These conditions were perfect for Lamphere, who spent all summer training in the Laser and is of an optimal body type for strong breeze. He climbed to the top throughout the day with extremely consistent finishes. He placed outside of the top 10 in only one race on Sunday. In the end, Lamphere won the event with a three-point lead over Harvard’s Juan Perdomo. Point totals were very close until the very end. Baird and Kiss also had great weekends. They were both very much contenders for the Foster Trophy and added to the high level of competition of the event – they both found themselves in the top three multiple times this weekend. Next weekend the Bulldogs will return to Old Dominion University for the Atlantic Coast Championships, which acts as the doublehanded championship for the fall season. To see full results from this weekend, visit http://scores.collegesailing.org/f15/icsa-lp-men-singlehanded/.